Author(s): Majid M. Heravi, Shima Asadi, Fatemeh Azarakhshi. Department of Chemistry, Alzahra University, Tehran, Iran. Quinolines as one of the most important classes of heterocyclic compounds are widely present as key structural motifs in many natural products, particularly in alkaloids and numerous bioactive drugs. Various name reactions for the syntheses of quinolines such as Skraup, Camps, Combes, Conrad-Lympach, Knorr, Gould-Jacobs, Povarov, Doebner and Doebner-von Miller, Pfitzinger and Niementowski, and Friedländer have already been discovered and extensively developed and modified. 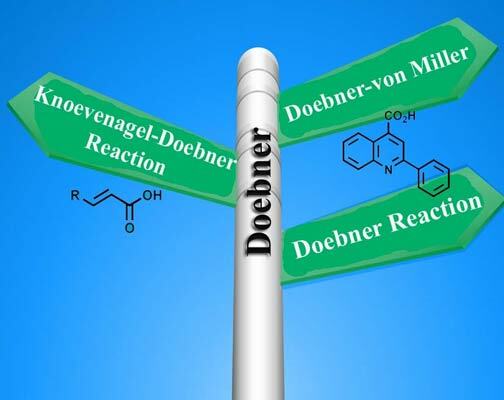 This review covers the most recent applications of Doebner and Doebner-von Miller reactions in organic syntheses. In addition the developments of the Knoevenagel- Doebner reaction in the synthesis of α,β-unsaturated carboxylic acids were demonstrated. In this paper we provide extensive compilation of the development of the Doebner reaction and variations for the synthesis of quinolines published from 2006 to 2013. Keywords: Doebner reaction, doebner-von miller, heterocyclic syntheses, Knoevenagel reaction, quinolines. Affiliation:Department of Chemistry, Alzahra University, Tehran, Iran. Keywords:Doebner reaction, doebner-von miller, heterocyclic syntheses, Knoevenagel reaction, quinolines. Abstract:Quinolines as one of the most important classes of heterocyclic compounds are widely present as key structural motifs in many natural products, particularly in alkaloids and numerous bioactive drugs. Various name reactions for the syntheses of quinolines such as Skraup, Camps, Combes, Conrad-Lympach, Knorr, Gould-Jacobs, Povarov, Doebner and Doebner-von Miller, Pfitzinger and Niementowski, and Friedländer have already been discovered and extensively developed and modified. This review covers the most recent applications of Doebner and Doebner-von Miller reactions in organic syntheses. In addition the developments of the Knoevenagel- Doebner reaction in the synthesis of α,β-unsaturated carboxylic acids were demonstrated. In this paper we provide extensive compilation of the development of the Doebner reaction and variations for the synthesis of quinolines published from 2006 to 2013.